AMP Concerts became an official business on September 10, 2004 and became a 501(c)3 non-profit corporation in 2007. Prior to that, AMP founder Neal Copperman spent four years putting on house concerts, sporadic small shows and volunteering with a variety of local music organizations. AMP's goal is to complement the music available around town, working both independently and in collaboration with many other local groups to provide additional chances to experience world, folk, acoustic and Americana music. AMP is also one of the producers of ¡Globalquerque! - New Mexico's Annual Celebration of World Music and Culture. In March 2015, AMP embarked on its next big step, opening a Santa Fe office headed by longtime Santa Fe promoter Jamie Lenfestey. AMP seeks to provide the same great, community-focused programming to Santa Fe and northern New Mexico, tailored to the specific needs and interests of the community. KUNM's Performance New Mexico feature on the Bosque House Concerts. This audio is courtesy of KUNM 89.9 FM, 3/21/2005. Neal launched the AMP House Concert series with then roommate Jeff Hanson soon after moving to Albuquerque. He has steered AMP from house concerts and a hobby to a sole proprietorship and eventually a non-profit organization. Neal's goal has always been to see the music he loved in other parts of the country be available in Albuquerque. Neal works full time as the Executive Director of AMP, and in his spare time works on AMP :) He is also on the board of the New Mexico Presenters Alliance, sporadically hosts KUNM's Global Music show, organizes the entertainment for the Santa Fe International Folk Art Market, helps organize and run ¡Globalquerque! and is active in many civic and arts projects around the city. Jamie Lenfestey's love of music was forged in his formative years during the heyday of the Minneapolis music scene. He was bitten by the concert business bug when he volunteered as a production assistant for the 20th Anniversary Earth Day Concert in Washington DC. That led to a variety of concert stints and two tours with the Steve Miller Band before moving to Santa Fe in 1991. There he helped start Fan Man Productions to produce shows around Santa Fe and Northern New Mexico at myriad clubs and venues like Sweeney Center, The Paramount and Paolo Soleri Amphitheater. When the Lensic was renovated into the Performing Arts Center it is today, Jamie was the first to book contemporary, popular music into that venue, and in 2001, emboldened by that success he began booking concerts at The Santa Fe Opera. In 2008 he helped produce the grand opening celebration for the new Santa Fe Railyard and fell in love with the vibrant, contemporary, youthful energy and feel of that exciting new district of Santa Fe. He began presenting sporadic free movies and concerts in the Railyard until his desire to do even more community events led him to join the non-profit Heath Foundation to form Heath Concerts. While at Heath, Jamie greatly increased the slate of events in the Railyard making the Santa Fe Railyard Concert and Movie Series a beloved part of summer in the City Different. He joined with Albuquerque's AMP Concerts in 2015 to take the opportunity to further connect Santa Fe and Albuquerque's live music fans and to continue to grow New Mexico's performing arts scene. Prior to moving to New Mexico, Chris McGlumphy was very active in the Classical/New Music world, where he has been the Executive Director of the Pittsburgh New Music Ensemble, Pittsburgh Chamber Music Society and Managing Director of Relâche New Music Ensemble. Chris isn't just an administrator, though. He's an accomplished musician (viola da gamba is his primary instrument) and composer, having composed a number of film scores, works for strings and electronics and theater scores. You won't be surprised to find that Chris has degrees in music, music technology and mathematics. Chris is a major force behind the scenes at AMP, writing grants, newsletters and press releases, managing our membership program and handling advance logistics on most of our projects. Chris is married and has two remarkable and very musical sons. Shalini Shanker is an accomplished fundraiser, engineer and educator who chose to apply this diverse skillset to improving the quality of public education and health and human services in New Mexico. Ms. Shanker’s career began as an automotive design and test engineer for Nissan Research and Development in Detroit and Tokyo. After moving to New Mexico, Shalini switched gears and entered public education. Over a ten year span at Amy Biehl High School, she served as a math teacher, administrator, and the Director of Institutional Advancement and earned a Bill and Melinda Gates Fellowship. In 2014, Ms. Shanker established and still runs NonProfit Solutions, a nonprofit consulting company in Albuquerque. Helen has a degree in ethnomusicology from University of California Santa Barbara and is a lifelong musical explorer. She has a particular interest in African music and has been on many exciting international adventures with the Afropop Worldwide team. We first met Helen during her tenure as Finance Director at the Santa Fe International Folk Art market. Helen has a long history of private consulting on computer systems, finances and accounting and is the current accountant for Performance Santa Fe. Ron is employed with State Government and enjoys a variety of music from various artist from folk, country, jazz, Northern New Mexican and 70's and 80's. He believes that music can be used in many ways from telling a story to teaching math. He was fortunate to have a teacher in 3rd grade that taught math through music and allowed him to read a story in history and put it to music. He believes in helping out the community he lives in through volunteering such as serving meals and helping out in food banks. Through our actions we teach the next generation about the arts and helping others. Abinash is a cardiologist at the University of New Mexico Hospital and the Deputy Secretary for Health for the State of New Mexico. (We are still excited about Abinash's political career, which happened after he became part of the AMP Board.) Abinash is a past president of the American Heart Association of New Mexico. Paul is an Executive Producer of Cable TV for Bernalillo County, NM, where he produces a variety of documentaries, studio and on location interview programs, as well as PSAs that highlight Bernalillo County's programs and services. He won a Rocky Mountain Emmy Award for the program "Hurricane Katrina Relief Efforts." Previously, Paul served as the creator, producer and director of "WILD New Mexico" for 8 years and 102 episodes. Jeff has been involved with AMP Concerts even before its inception, working with Neal Copperman on the Bosque House Concerts, which hosted over 100 shows in seven years in Jeff's living room. Besides being involved in AMP Concerts, Jeff is a Manager at Sandia National Labs and enjoys cooking, bowling, theater, and fine dining. Jeff's musical interests span a pretty wide range, but his favorites tend to be female singer-songwriters with big voices, a la Kate Bush, Jane Siberry, Jewel, Alison Moyet, and Wendy Rule. 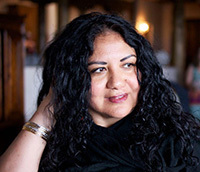 Alicia Lueras Maldonado is a Native New Mexican and the President & CEO of Atlixco Productions. She holds a B.A. in Communication & Journalism and a B.A. in Spanish from the University of New Mexico, with concentrations in photography, film, literature and dance. Through her business, she helps individuals and organizations design creative strategies for their work and uses the arts and organizing as tools for positive community engagement and social change. She is a facilitator, creative consultant, photographer, actor, producer and director. She has spent the last 20 years working within the intersections of art, politics, community organizing and social justice. Alicia is the current Board President for AMP Concerts, a Board Member for the Albuquerque Theatre Guild and the former Governing Council President for South Valley Academy. She is also a member of Las Meganenas, a Latina theatre troupe. Alicia believes that the arts, in all its forms, are an essential fabric that helps to hold a society together. In case there is any confusion, Alicia is in charge of the beans. Lupe was born in Mexico and raised in New Mexico. She has been employed at PNM for the past sixteen years in the Human Resources department. Her background in HR has enabled her to build strong relationships within the community. Lupe is also a member of, Mala Maña, an all woman voice & percussion ensemble. Mala Maña has been hitting the stages for over five years locally and has toured out of state and released their first album in 2013. She has been acting treasurer to Mala Maña since its inception, and does booking, marketing and tour management. Lupe has worked with emerging artists such as Cuban trovador Jorgito Kamankola on the release of his debut album, which included creating his website, other social media, and launching a Kickstarter campaign. She is passionate about continuing to help promote new artists and bring their voices to the forefront. Rachel moved to Albuquerque in 2007 after working for 2 years in Mauritania, West Africa as a Peace Corps Volunteer. Originally from Ventura County, California, Rachel has always loved going to all sorts of concerts, festivals and small local shows. After many years of faithful attendance as an energetic and supportive audience member, Rachel decided to expand her role in the world of live music to also include serving as a behind-the-scenes contributor. She started by taking on several pivotal roles with the Albuquerque Folk Festival before joining the AMP Concerts board in 2013. Rachel is excited for the opportunity to help bring the delight and joy that she experiences from a live performance to as many people as possible, all year long. Rachel also enjoys hiking, camping, traveling, healthy living and learning to play the mandolin. Rachel is currently the volunteer coordinator for the Albuqueruqe Balloon Museum and is actively spearheading a zero waste lifestyle community in New Mexico at WasteLess Life NM. Sue has been AMP's web designer since the early house-concert days. She lives in the San Francisco Bay Area (but enjoys visiting New Mexico!). Along with web sites, Sue also designs print book interiors. Find her online at interbridge.com. "I've been to many of the shows you've promoted and I'm very grateful for your presence in Abq and how you've totally uplifted the music scene. Providing these small and midlevel venues is exactly what these artists need to flourish and then music lovers like me are the beneficiaries. So thanks again and keep it up!" "Thank you for all the great music! Of the many awesome AMP Concerts shows I've seen a few really touched my heart and soul, particularly Oliver Mtukudzi, Baka Beyond, Vieux Farka Toure, and Johnny Clegg. Amazing, talented musicians that I never thought I would get to see in my lifetime so thanks so much for bringing them to Albuquerque." "I wanted to say THANK YOU for bringing Paco de Lucia to Abq! It was by far the best concert I've ever seen! Paco and the other musicians were absolutely mind blowing! I have never been so inspired. I appreciate all the hard work you do to present quality, world-class music to the Abq community. We are INCREDIBLY LUCKY!!" "I wanted to thank you so much for booking the Tom Russell show at the Outpost. I drove down from Aztec to catch the show. I have seen Tom over 20 times, and this show was absolutely one of the best! Everything was perfect. The venue and sound were great, the audience was great, and so was Tom. It made for a wonderful evening of great music. I hope that Tom Russell can become an annual event at the Outpost." "It is important for individuals with severe disabilities to have the opportunity to listen to good music. Thanks." "The concert was AMAZING! AWESOME! ABSOLUTELY LOVED IT! I don't know what I enjoyed more- seeing Steve Martin live, or the incredible musical talent of the Rangers. As he said, 'They are not my band, I am their celebrity.' I went with my husband, two daughters, another couple, and my sister and her friend who were visiting from Florida. Everyone left the room smiling :-) That's quite a feat, given our varying ages and personalities! So, thank you! We love live music and go as often as possible and are always up for exploring new venues." "Looking forward to a family bilingual show. We want to thank the organizers and producers that make a tremendous effort to bring bilingual, cultural and quality performances to New Mexico." "I wanted to thank you for handling the stage all weekend long!!! What a great job you did with the line-up—everyone loved it!! West African Highlife was the life of the party—truly. I really appreciate how hard you work for the [Santa Fe International Folk Art] Market and the entertainment groups—they are such an important part of what we do and you make it happen!!" "Lenny and I were at the Emmylou Harris concert on Sunday night which was fantastic! AND have come to both days of Globalquerque all years since you got it started. We love it, and have gotten lots of our friends to go too. I have such high regard and excitement about what you and AMP contribute to the musical life of our community—I simply want to add some support to your efforts as a non-profit. I've been on your e-list for years: today I decided it was time to make a donation too :-). "Just so you know... we've already purchased our earlybird tickets for Globalquerque this year, including a third ticket for my brother traveling to NM just to attend again. He came last year too. He's a music collector and youth worker from Central New York state—and we ALL have fallen in love with Globalquerque. See you there this September!" "I've been meaning to write you for the last month and thank you for bringing Johnny Clegg here and to such a beautiful venue. It was a great concert and a great experience overall, being outside and getting to dance with the kids, plus my family and I were able to express to Johnny Clegg how much his music has meant to us over the years. Thanks for all you do!" "Just a thank you for your delightful presentation at Creative Albuquerque yesterday. You shared lots of valuable information and gave us new perspectives to think about. It will be so exciting to host at least one of those Pakastani groups in Albuquerque. Thank you for all you do for Albuquerque and the arts. You are amazing, and definitely one of the gems of our city!" "Thank YOU for the rare treat! My friends in fancier places (Atlanta, Los Angeles, New York, Helsinki) couldn't believe Albuquerque ('where is that exactly?') got to see Philip Glass up close and personal, and for only $45." "I wanted to take this opportunity to thank you for getting the Philip Glass 'mini-festival' together—I was able to attend the discussion at Keller Hall (and especially was entranced by PG saying what really mattered was writing the spaces!) and also the performance at the Academy. My son's funeral was held in Simms, so it's hard for me to go there, but it was worth it to see Mr. Glass bring his music to life. I think my Tyler would also have liked that concert. So, thanks again for all your hard work on our behalf. This was a special evening." "What a GREAT concert last night by Badi Assad—the best single act performance I've seen/heard in a long, long time—those who did not attend lost out. I hope that she felt rewarded for her performance. My wife and I are on your list serve. Take this for what it is worth—you're doing a GREAT job of bringing world music to NM. We are fans of AMP CONCERTS." "you ROCK! this is the best free concert series ever! Love ABQ, love AMP, love the Rio Grande Libraries!!" "I just love all this music you are bringing to Albuquerque. Here's a great big thank you from me!" "I'll be bringing my group of guys... they've been asking me when the next time we could go on a field trip to hear great music... we've enjoyed four concerts so far and they've been hits with my clients. So thanks again for what you're doing, and how in particular these free library concerts are enriching our community." to see and hear music." "I just want to say thank you for this afternoon's concert. It is the first time my husband and I attended one of your events at VSA, and were not only blown away by the music, but felt great joy in seeing everyone get into the groove, it was very special indeed!"